Happy Monday you guys!! If you follow me on Instagram then you may already know that I was in Tulum, Mexico last week. My mom and I went a couple of years ago but didn’t get to explore very much, so I was excited to go back and see more of Tulum – for being in the middle of the jungle, it has changed and grown a lot in just two years. There are tons of restaurants now and it was surprisingly pretty crowded everywhere we went! This particular day I wore this cute ruffle dress for heading out to find lunch. We were in search of a restaurant called Raw Love, an outdoor restaurant with the BEST açai bowls! On the way to the restaurant we stumbled upon the cutest resort with lots of quaint little huts on the beach (where all of these pictures were taken). 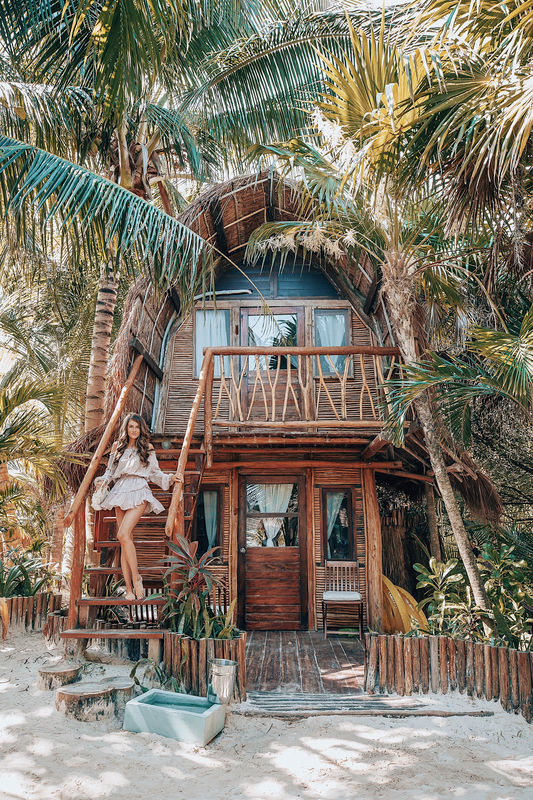 The name of the hotel is Ahau Tulum if you’re interested – I personally didn’t stay there so I can’t review it, but it was certainly cute and had a beautiful beach! The sunny weather in Mexico was such a nice reprieve from the freezing temperatures in Charlotte – I tried to soak in as much vitamin D as possible while I was there! If you missed it, I wrote a blog post last week about how I suffer from Seasonal Affective Disorder (SAD) during the winter. Thank you, thank you, thank you for all of the positive comments you left on that post – many of you struggle with SAD as well, and it was really nice to know that there are so many of us in the same boat. Quite a few of you guys recommended sitting in front of a light box in the morning, so I ordered this one off of Amazon. I’ll keep you guys updated on how it works! P.S. Let me know if you’d like a full travel guide to Tulum! I love your outfit Cait, looks so cute! Tulum sounds like a dream! How adorable is this dress! Tulum looks amazing! I DEFINITELY want to see a full travel guide on Tulum! I’ve been dying to visit there, and I’m considering it for my honeymoon this fall! You look absolutely beautiful in this dress! It was made for you! Oh i am just obsessed with that dress! Loveshackfancy dresses really have something so whimsical and unique about them! Also how cute are those little huts – perfect vacation spot! Have a good start to the week lovely. These photos are stunning as usual Caitlin! Would love to see a full travel guide. Loving the dress! It is so cute for spring. Yes, please do a guide on Tulum! You’re guide on Tulum a couple of years was amazing! I’m curious to know what is different now or if things are the same since you’ve been back. Hope you had a great time! Yes, always! Full travel guides are always welcomed! Hehe. Pretty bummed that the purse is from a local boutique in Tulum, I’m going to go on a hunt and look for a similar bag in the meantime! Such a cute outfit and I’m loving those little huts! An acai bowl sounds amazing right now! Such a gorgeous destination! Would love to see a full travel guide! A friend of mine leads yoga retreats in Tulum. Loveeee this outfit! And would really like to read a full travel guide! I enjoy living vicariously through you! Caitlin! Your photos from Tulum are absolutely gorgeous! My husband and I are planning a trip for this May, and are considering Tulum! I would love to see a full travel guide if you have time! Thanks!! What kind of camera do you and your brother use? Your pictures are always stunning! I would love to see a full travel guide. I have been wanting to go! Did you fly into Cancun and then take a bus down to Tulum or fly straight into Tulum? Did you get to see the ruins? Anything you recommend? How dreamy! I love that bag, it is so boho chic…You look gorgeous girl! Love Tulum, love acai bowls and love anything LoveShackFancy:)! You are so beautiful. I’m loving that dress!